Hi, Everyone. My name is Susan and I’d like to share with you my story of how I learned the value of choosing to eat healthy, and the incredible impact it has had on my life. I met my husband (I’ll call him W) about 10 years ago. We had both gone through nasty divorces (aren’t they all) and had spent a lot of time in our separate lives healing ourselves emotionally. We met online and after a couple of weeks of online chatting, we agreed to meet at a local coffee shop. We quickly hit it off, dated for a couple of years, and were married shortly after. As is often the case when you are in a new relationship, we enjoyed going to nice restaurants, cooking gourmet meals at home, and drinking some very nice wines and all those yummy craft beers. W and I soon put on the extra pounds. We weren’t too concerned about it because we were both getting fat together, so there wasn’t any judgement going on between us. We just joked and laughed it off, recognizing that we were having fun in our new life together during our Golden Years. So, as the story always goes, one day things changed. We were hanging out at home, catching up on emails and just generally relaxing, when W started having significant chest pains. He managed to ignore it for awhile, but every few hours the heavy pressure and chest pain would come back. I don’t know how he did it, but he managed to get some sleep that night and then called his doctor the next morning. His doctor, of course, sent him straight to the hospital where he was seen by a cardiologist (Dr. H). Dr. H ran some tests and strongly recommended that W go to the CATH lab (catheterization laboratory) where they could insert a small tube into a vein in his arm, inject a dye, and then use x-ray images to view the dye as it traveled through his heart. Scared out of our minds, we of course said yes. Dr. H performed the procedure, and sure enough, he found a significant blockage in W’s right coronary artery. He inserted a stent, put W on several medications, and told him he was about 3 months away from a massive heart attack if he hadn’t come in. W, feeling as though he’d just been handed a death sentence, started reading everything he could find about heart disease. It didn’t take long to figure out that our high-calorie, high-fat, high-sugar diet, combined with a mostly-sedentary lifestyle was killing us. One of the first books he picked up to read (ironically, it was at the grocery store) was Dr. Esselstyn’s Prevent and Reverse Heart Disease. 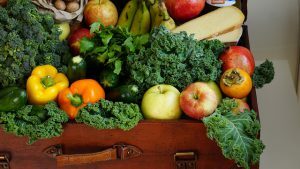 We learned from Dr. Esselstyn and other prominent doctors that eating a mostly plant-based diet provides enormous protection against heart disease. Not only that, but by changing your diet, you can actually reverse the blockages in the arteries. Are you kidding me?! Why didn’t we know about this?! So, we both chose to adopt Dr. Esselstyn’s vegan recommendations and began the journey of cleaning out our cardiovascular systems and regaining control over our health again. Letting go of our fast-food, high-fat, high-sugar lifestyle was difficult. But what price tag do you put on your health? There’s nothing on earth that is worth clogging up your arteries over. We’ve learned over time, the true meaning of moderation. We found that once you cut out the excessive amounts of sugar, salt, and fat normally found in today’s modern diet, and once you bust through the food cravings stage, then you can actually enjoy some healthy treats now and then. We still enjoy our wine, and we still enjoy our beer, and now we enjoy eating fish with our evening meal several times a week. Sometimes it’s salmon, sometimes it’s cod, sometimes it’s flounder or something else. But we found that pairing a plant-based diet with fish is a wonderful combination that provides an excellent protein source that keeps us energized all day. For anyone who wants to learn how to take control of their health by eating a healthy diet and making lifestyle modifications, I hope that I can help bring some suggestions on what we found to be some of the best plant-based food choices and products on the market. I’ll also share many of the recipes that W created when he couldn’t find what he was looking for at the grocery store or when eating out at restaurants. Adopting a plant-based diet also gave us the motivation to update some of our old kitchen pots and pans, and add in some new and fun kitchen gadgets to help save time when preparing our own meals. I’ll make some suggestions on kitchenware that has helped make meal prep a breeze. W has also significantly increased his cardio exercise, so I’ll also share with you some of the best fitness equipment and technology that he’s discovered. 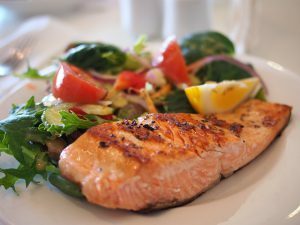 I hope this site can help you learn how to take control of your health by eating a plant-based diet with excellent protein sources (such as fish), cooking your own healthy meals at home, explaining how to order healthy meals at a restaurant, and presenting some fun activities to help improve your overall fitness, so that you, too, no longer need to live in fear of the life-threatening effects of heart disease. If you ever have a question, please reach out to me. You can email me at Susan@Fearless-Eating.com, or you can leave a comment below. I’ll do my best to answer all of your questions.